Spaghetti Squash really is nature’s miracle food- Delicious, buttery, and perfect for healthy meals. 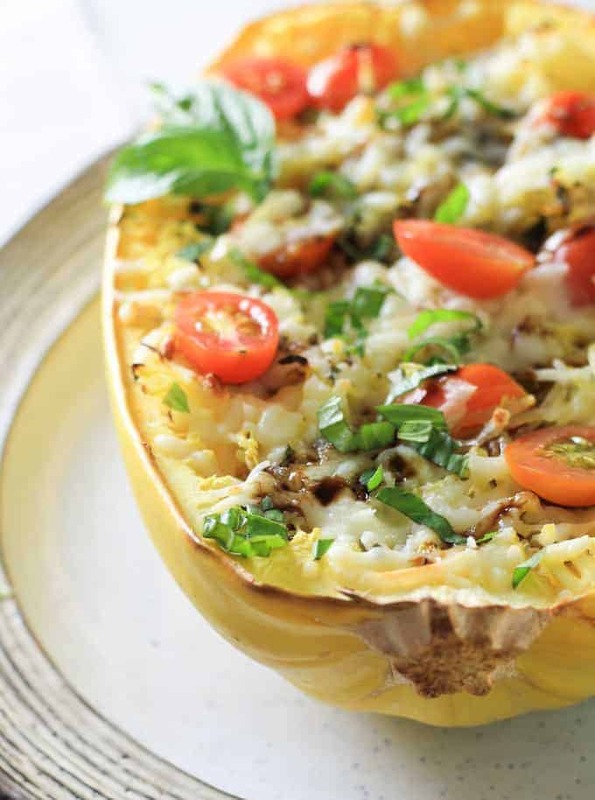 We went nuts over this Caprese Spaghetti Squash. A vegetarian meal that can easily be topped with leftover chicken for you carnivores. Drizzle with some balsamic reduction for added flavor. Yum! Fresh basil is the key to huge flavor with this Caprese Spaghetti Squash. 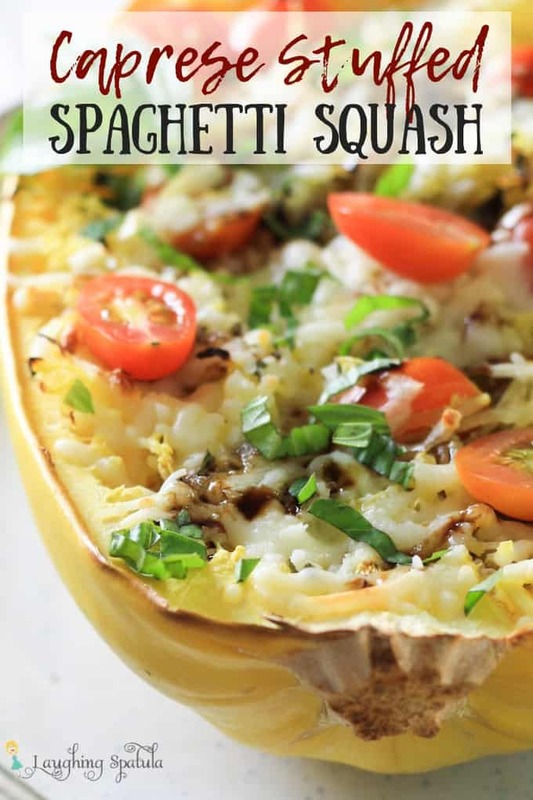 A few tips on perfect spaghetti squash to make this meal easier for you! Spaghetti Squash is tough. It’s a hard squash, and it’s difficult to cut in half. BE CAREFUL. We microwave ours for 2 minutes (pierce a few holes in it so it doesn’t go kablooey though). Let cool for a few, and then cut with a cerated knife. If you want to be extra safe- wear some steel gloves. Sounds good, looks goofy, but you’ll thank me later when you don’t have nubbins for fingers! Drizzle with olive oil, salt, and bake it facing down. This helps the juices flow downward so you’re not left with soggy squash. *Soggy squash sounds like a medical condition and that makes me giggle. We bake ours at 400 degrees Fahrenheit for 30 minutes. Short on time? 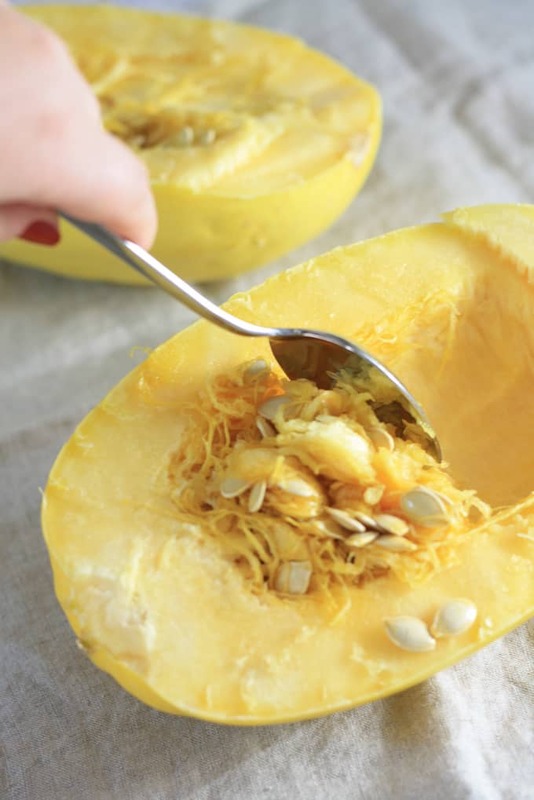 Here’s a great tutorial on how to microwave spaghetti squash! Scoop out the seeds with a large spoon. Once you’ve baked (or microwaved!) your spaghetti squash, shred it with a fork. Use the fork to pull the spaghetti squash away from the edges. It will be tender, and should shred easily when fully cooked. It’s magic I tell ya, magic! 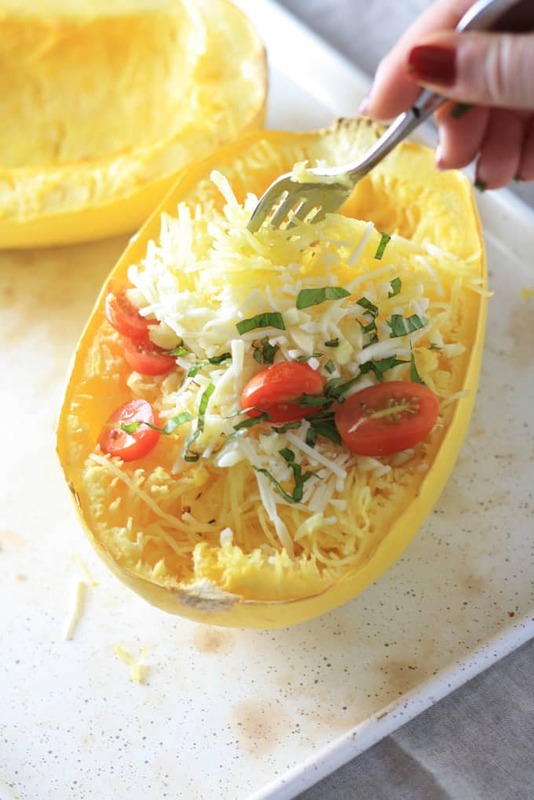 A simple shred with a fork and you have perfect Spaghetti Squash. It’s nature’s spaghetti miracle! Once you’ve shredded your spaghetti squash, add your caprese ingredients! I used shredded mozzarella, cherry tomatoes, and fresh basil. I really have to emphasize using fresh basil– it gives it such a better flavor than the dried kind. Though I used shredded mozzarella, if you have a log of fresh mozzarella it would be even better. I was just trying to be healthy and use less cheese, ya know? Toss with EVOO for a flawless finish. 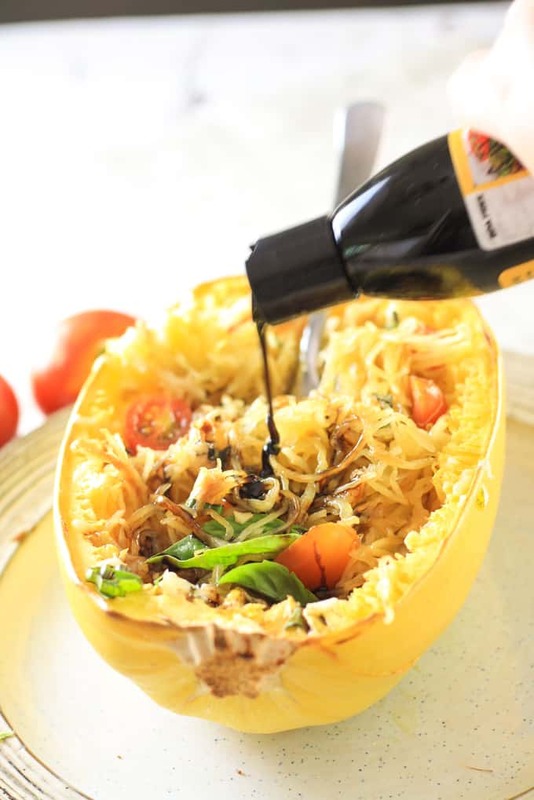 I like to drizzle my Caprese Spaghetti Squash with balsamic reduction- I use Nonna Pia’s. They are based out of Whistler, BC and were sweet enough to send us some samples. This stuff is delicious! Drizzle with some balsamic reduction for added flavor. Looking for a few other meatless meals? Check out our Lemon Cavatappi with Asparagus and Garlic, this delicious Soba Noodle Salad with Homemade Peanut Sauce (you could fry a flip flop & dip it in this sauce- truly, it’s amazingly delicious!) or even these Lasagna Roll Ups, a treat for the WHOLE family (and the kiddos love to make them, too!). A delicious twist on classic spaghetti squash; Loads of flavor make this vegetarian dinner perfect for the whole family! 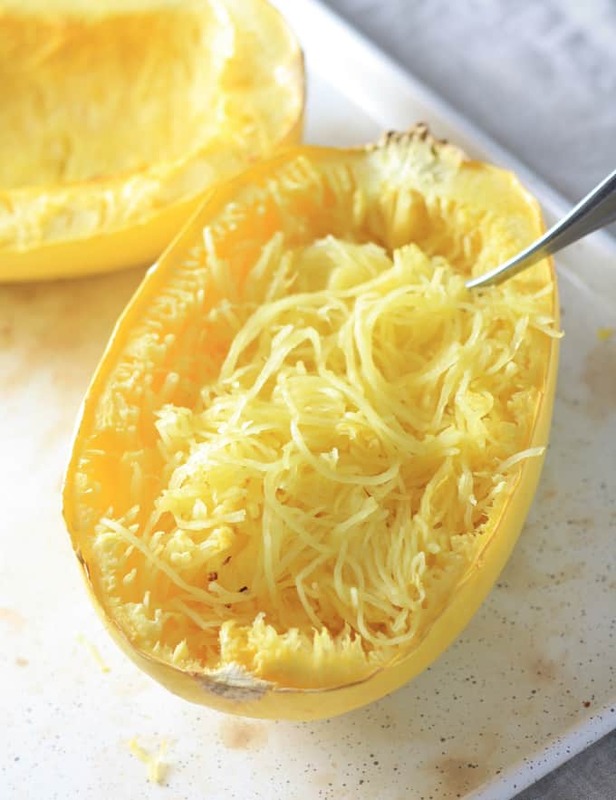 Cut spaghetti squash in half (see tips above for help with this!). Drizzle each side with 1 tbsp olive oil, & salt, and pepper to taste.Bake at 400 degrees for 40 minutes. 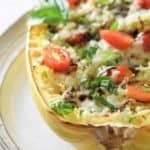 Remove spaghetti squash from oven. Shred spaghetti squash with fork. It should be tender, and split right apart from the hard exterior of the squash. Toss in remaining 2 tbsp olive oil, coating spaghetti squash threads. Add in cheese, tomatoes, and basil. Bake for 10 minutes. Drizzle with balsamic reduction if desired & serve. 6 Weight Watcher Freestyle Points for each half of squash. Add 2 points for 1 tablespoon balsamic reduction. Spaghetti Squash is tough. It's a hard squash, and it's difficult to cut in half. BE CAREFUL. We microwave ours for 2 minutes (pierce a few holes in it so it doesn't go kablooey though). Let cool for a few, and then cut with a cerated knife. If you want to be extra safe- wear some steel gloves. Sounds good, looks goofy, but you'll thank me later when you don't have nubbins for fingers! Drizzle with olive oil, salt, and bake it facing down. This helps the juices flow downward so you're not left with soggy squash. *Soggy squash sounds like a medical condition and that makes me giggle. We bake ours at 400 degrees Fahrenheit for 30 minutes. Short on time? Here's a great tutorial on how to microwave spaghetti squash!